I love the colours chosen for this months Rainbow Scrap Challenge, but I only had three fabrics that fit into this category. It wasn't enough to do the normal blocks I do, and I didn't want to add another blue, as it would end up being the same as last month. I decide to search through those projects I'd saved onto my computer to see if any would fit in, and I came across one of Kaaren's First Friday Freebies which was perfect to adapt to suit the fabric. The stitching was done on plain white fabric, and I've used a piece of Warm and Natural batting for the needle keep. All I need now is add a small floss tag, and it will be complete. There is still some of the fabric left, so I've found another one of Kaaren's patterns I've saved, which I hope to get done by the end of the month. A big thank you to Kaaren, for coming up with such lovely projects on a regular basis, they are a joy to make. I have learned to love those colors. I hope to work with some of mine today. Very nice job. How cute and adorable. Turquoise is also my favorite color. I have lots of it too. So lovely and the colour is to die for. Beautiful stitching and a nice combination! 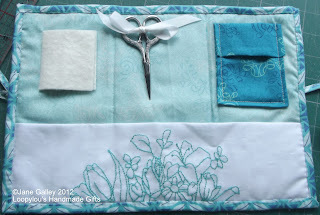 Beautiful use of teal fabrics. Such a useful sewing kit to have around. Such a pretty useful piece. Love the embroidery.. it works so well on that piece and the colors are perfect. This is absolutely beautiful. Your embroidery is so delicate and pretty. I find this a tricky colour to work with but, as always, you've produced a really lovely item. The stitching is gorgeous.